This week, I opened a bottle that I’d been looking forward to for quite a while – the last Kernel Brewery beer in the cupboard, and possibly my last for a while. I have always had a soft spot for The Kernel. I love the big flavours they pack in. I love the branding. And I really love the ‘artisan’ feel to the whole operation – the impression I always get that Evin brews whatever the hell he feels like making when he wakes up in the morning, rather than operating to any sort of formal schedule. It is, in short, a properly good brewery. But things aren’t perfect, as the picture above hopefully illustrates. 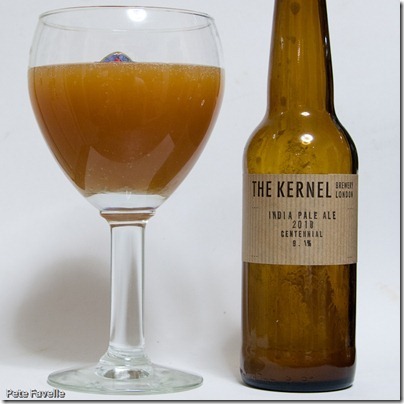 Kernel beers have always had a fair bit of sediment. Now any bottle conditioned beer is going to have some sediment and that’s no bad thing. I’m not afraid of a bit of murk in my beer; I even like the yeasty hint that a little sediment can bring to a beer. However, their beers tend to have a lot more than most. Recently, it seems to have got worse. There’s now a quarter inch of sediment in their (relatively small, 330ml) bottles. Far worse, every bottle that I’ve opened in the last few months – after dutifully letting them to sit and settle for a few weeks – have gushed a little, churning up all that sediment until I end up with a glass that looks more like I’m drinking something from the local pond than an awesome tasting beer. And so today’s monster beer looks rather more like a cold coffee. Murky and muddy, with no head to be seen and too opaque to see if there are any rising bubbles. On the other hand, the nose is magnificent; sweet floral hops, a hit of alcohol, and an orange acidic tang. The taste is … odd. There’s a gentle sweetness, with buckets and buckets of those sweet citrus floral hops. The fizz is a little aggressive, but aside from that the major flavours balance out deliciously. The alcohol is there, but subtle and understated and you’re left with a wonderfully gentle, lingering hop bitterness. But underlying all of that is a slightly unpleasant and pervading yeastiness that serves to distract from what should be a real gem of a beer. I’m frustrated, and that’s largely because I know how damn good The Kernel can be – I only hope they can fix it, because until they can I don’t think I’ll be restocking my cupboard with their bottles. That does look rather like used dishwater it’s true. I dragged 6 bottles of Kernel in my suitcase back up to Manchester from London last week so I was expecting to have to stand them in a cool, dark, cupboard for at least a month before going anywhere near them! I couldn’t resist trying the IPA Black Rye the other night though and it opened fine and surprisingly clear – for a dark beer. Could it be an issue with the fact it’s the 2010 Centenial? Was the beer made in 2010? I thought that hop flavours in beer diminish fastest. While the packaging it’s undeniably awesome, sometimes I think that a little more detail would be helpful!